Tel Aviv University and Aviv Analytical. July 22, 2013. The use of a fly-through ion source in combination with sample compounds in supersonic molecular beams (Cold EI) eliminates any ion source peak tailing and/or sample degradation on the hot metallic ion source surfaces. The use of GC-MS with Cold EI opens the door for significantly increased range of compounds and applications that are amenable for GC-MS analysis. Consequently, GC-MS with Cold EI bridges the gap with LC-MS, helps to analyze the bottleneck hard to analyze compounds in current methods and opens the door for new and untapped opportunities in GC-MS analysis. Keep reading to find out how the Aviv Analytical 5975-SMB GC-MS with Cold EI uniquely enables significant extension of the range of compounds amenable for GC-MS analysis and as a result enables new types of GC-MS applications. Experiments were conducted with three GC-MS with Cold EI systems and in various experimental conditions thus we provide below only those conditions that are typical for experiments performed with the Aviv Analytical 5975-SMB GC-MS with Cold EI. Systems: 5975-SMB GC-MS with Cold EI system of Aviv Analytical which is based on the combination of Agilent 5975 MSD with the Aviv Analytical GC-MS with Cold EI with its supersonic molecular beam interface and fly-through Cold EI ion source. Injectors: Various injector temperatures where employed that were lower than usual in view of the high injection column flow rates such 150ºC, or the use of temperature programming. Deactivated liners were used without glass wool. Columns: Typically 5 m, 0.25 mm ID with 0.25µ film of DB-5MS UI or equivalent. He column flow rate: Variable in the range of 5 ml/min up to 100 ml/min. SMB source: 12 mA emission, 700 mBar nozzle backing pressure, 62 ml/min total He make-up and column flow rate. SMB transferline temperature: Temperature programmed in the 150ºC to 320ºC range. While for standard GC-MS operation elution temperatures are approximately fixed in all methods of operation, in GC-MS with Cold EI they can be controlled and be significantly lowered. We found that for every factor of two shorter column and/or higher column flow rate, the elution temperature is lowered by about 20ºC. (13ºC for non-polar compounds and up to 35ºC for polar compounds). This finding is explained in details in the paper of A. B. Fialkov, A. Gordin and A. Amirav, J. Chromatog. A. 991, 217-240 (2003). Figure 1 at the bottom left shows the dependence of pyrene elution temperatures from several column lengths versus the column helium flow rate (in ml/min). As shown, the pyrene elution temperature can be lowered by over 200ºC!, from 287ºC to 79ºC. Accordingly, pyrene with four aromatic rings can elute in GC-MS with Cold EI at a lower temperature than benzene with one aromatic ring from a standard GC-MS column and conditions. In fact, this record low pyrene elution temperature is lower than pyrene elution temperatures in SFC with CO2. Similarly, high flow rates during the injection with a PTV injector lower the elution temperatures from the liner into the column. Such large reduction in the elution temperatures can lead into a significant extension in the range of compounds amenable for analysis, if a contact-free fly-through ion source is used, as in the Aviv Analytical 5975-SMB GC-MS with cold EI. In Figure 2 below (right side) we demonstrate intra-column degradation of the thermally labile compound aldicarb (a known thermally labile carbamate pesticide), and the elimination of this intra column degradation through lowering the aldicarb elution temperature via increased column flow rate. A 6 m 0.25 mm ID column was used with 0.25 µm DB5ms film and temperature programming rate of 35ºC/min. The transfer line and nozzle temperatures were 200ºC and the injector temperature was 120ºC. The indicated column flow rates were 1 ml/min for traces A and B and 16 ml/min for trace C. Trace B shows the production of aldicarbnitrile which is a known intra column thermal degradation product of aldicarb. Thus, while aldicarb is fully degraded when analyzed with a standard 30 m column and 1 ml/min column flow rate, it can elute with partial degradation from a 6 m short column, and when the flow rate is increased to 16 ml/min aldicarb degradation is fully eliminated. and column temperature programming rate. temperature below the onset of its degradation. Thus, as demonstrated, when the column flow rate is increased from 1 ml/min to 16 ml/min the aldicarb elution temperature is lowered below the onset of aldicarb degradation into aldicarbnitril and the aldicarb peak intensity is increased by about ten times. Consequently, both injector and intra-column degradation can be fully eliminated for many compounds via the use of short columns, high column flow rate and preferably with a temperature programmable injector. However, Cold EI with its fly-through ion source needs to be used as these labile compounds easily degrade in standard ion sources and the availability of molecular ions (m/z=190 for aldicarb) is a must as an evidence that these compounds eluted intact. In Figure 3 we demonstrate the extension of the range of compounds amenable for GC-MS analysis via the analysis of polywax 850 with its aliphatic compounds up to C86H174. The upper trace shows the obtained total ion count mass chromatogram with arrows indicating C28H58 which is the last compound that exhibits a useful molecular ion (when a standard GC-MS is used), C42H86 which is about the last compound to elute from such a mixture in standard GC-MS and C72H146 which is the first hydrocarbon with molecular weight of over 1000 amu whose Cold EI mass spectrum is shown at the bottom trace. Note the dominant molecular ion of C72H146 and the observation of some doubly charged molecular ion plus the usual fragments. In summary, Figure 3 demonstrates the approximate doubling of the range of compounds amenable for GC-MS analysis and tripling of the range of hydrocarbons that can be analyzed with useful molecular ions. Figure 3. The analysis of polywax 850 with the 1200-SMB GC-MS with Cold EI. Experimental details are given in "A. 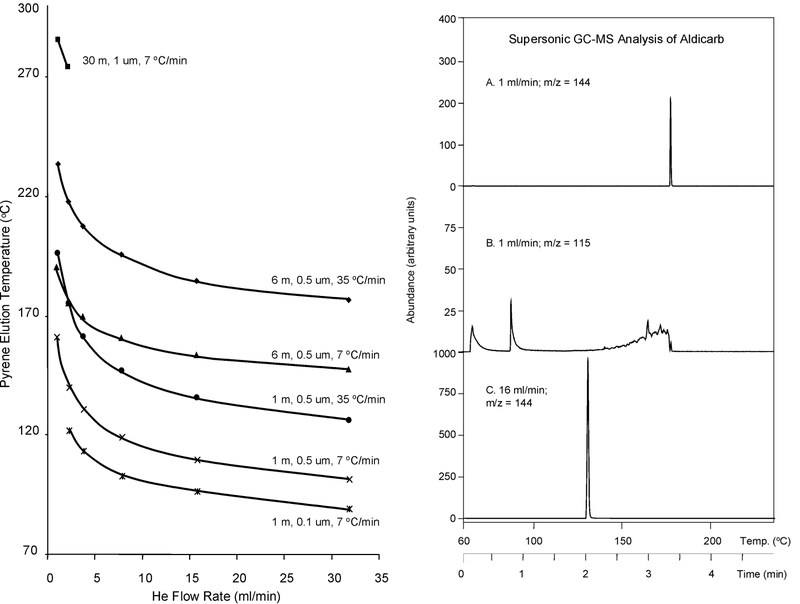 B. Fialkov, U. Steiner, L. Jones and A. Amirav “A New Type of GC-MS with Advanced Capabilities”. Int. J. Mass. Spectrom. 251, 47-58 (2006). In Figure 4 we demonstrate the analysis of a large polar drug such as Reserpine which is unique to the 5975-SMB GC-MS with Cold EI and can not be analyzed by any other standard GC-MS. Reserpine exhibited its true molecular ion with m/z=608.3, was easily identified by the NIST library and its elemental formula (C33H40N2O9) was confirmed with the TAMI software. The small peaks near the Reserpine elution time are of its impurities including of deserpidine that eluted at 11.23 min. Figure 4. 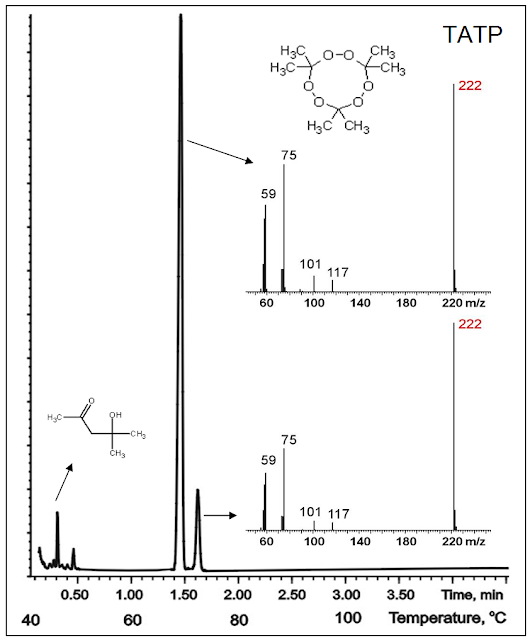 The analysis of Reserpine with the 5975-SMB GC-MS with Cold EI. 5 m 0.25 mm ID column was used with 16 ml/min helium column flow rate. Note the dominant true molecular ion with m/z=608.3. While in Figure 4 we demonstrated the analysis of a large polar compound some of the challenges are in the analysis of small yet highly thermally labile compounds such as a few of the explosives. One important challenge is to be able to properly analysis peroxide explosives such as triacetonetriperoxide (TATP) (or HMTD) that are often used by terrorists due to their ease of concealed preparation. In Figure 5 we demonstrate the analysis of TATP using GC-MS with Cold EI and furthermore we demonstrate that its two conformers can be analyzed and that their Cold EI mass spectra are characterized by having dominant molecular ions with m/z=222. While TATP can be analyzed by standard GC-MS it is mostly decomposed in the column, does not show any molecular ion and its less stable second to elute conformer does not elute at all. In addition, with Cold EI in SIM mode the detection limits can be in the low femtogram range which is about three orders of magnitude better than what can be achieved with standard GC-MS or LC-MS. Figure 5. 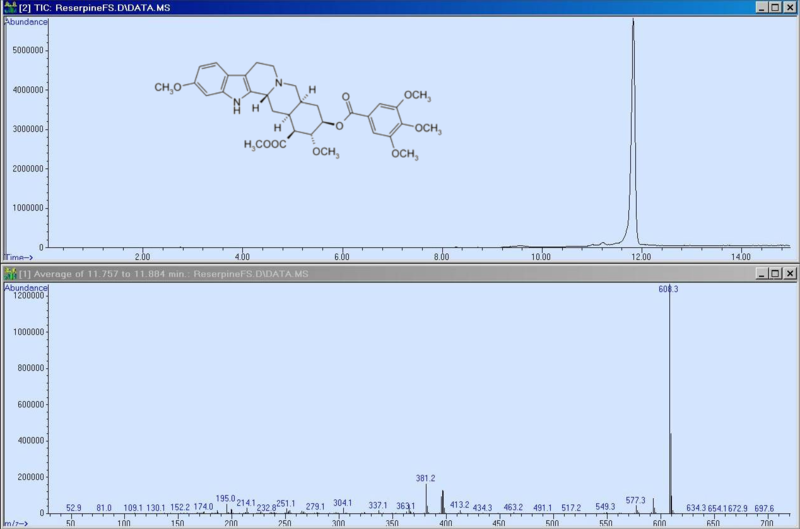 The analysis of triacetonetriperoxide (TATP) using the 5975-SMB GC-MS with Cold EI. Note the low elution temperature of 69ºC. The injector temperature was 140ºC for this analysis. While for thermally labile and low volatility compounds the extension of the range of compounds amenable for analysis can be the difference between "can be analyzed" and "can not be analyzed" as shown above, often the analysis limits of standard GC-MS are more gradual as its response simply declines with mass and volatility due to ion source peak tailing and loss of molecular ions mass spectral peaks. The topic of intra-ion-source peak tailing is discussed in another post in this blog. 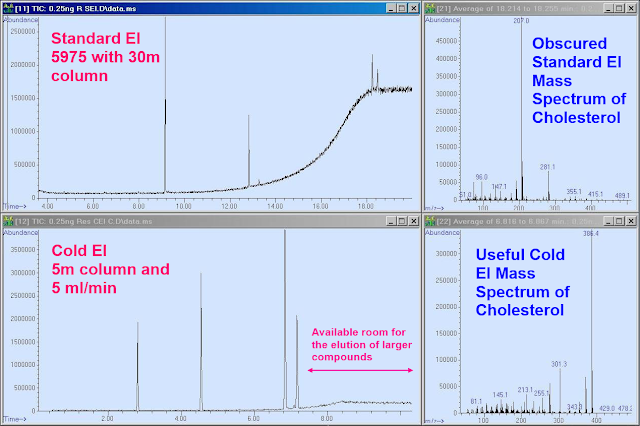 In Figure 6 we compare standard GC-MS (Agilent 5975 MSD) and the 5975-SMB GC-MS with Cold EI in the analysis of a mixture of 10 ppm each hexadecane (n-C16H34), methylstearate, cholesterol and n-C32H66 that were injected with split ratio of 40 (250 pg each compound on-column). The upper trace shows the results of a 20 minutes analysis obtained with a standard Agilent 5975-MSD GC-MS, operated with a 30 m standard column and 1.2 ml/min column flow rate, while the bottom trace shows the results of a 10 minutes analysis obtained using the 5975-SMB GC-MS with Cold EI that was operated with a 5 m, 0.25 mm ID column (same column type) and 5 ml/min helium column flow rate. The upper right side of Figure 6 shows the standard EI mass spectrum of cholesterol that is dominated by column bleed while the bottom right mass spectrum is the Cold EI mass spectrum of cholesterol that is clean and with a dominant molecular ion. As clearly observed in Figure 6, the response of standard GC-MS gradually declines with the mass and volatility of the sample compounds while GC-MS with Cold EI is characterized by uniform compound independent response. Furthermore, the use of a shorter column with higher column flow rate lowered the elution temperatures of cholesterol and n-C32H66 that as a result eluted prior to the onset of column bleeding. Consequently, the Cold EI mass spectrum of cholesterol as demonstrated in Figure 6 is free from column bleed interference and evidently there is room to elute much bigger and less volatile compounds with GC-MS with Cold EI than with standard GC-MS. In addition, as clearly observed the sensitivity of GC-MS with Cold EI is superior to that of standard GC-MS and the bigger the compound the greater is the gain in sensitivity. Figure 6. 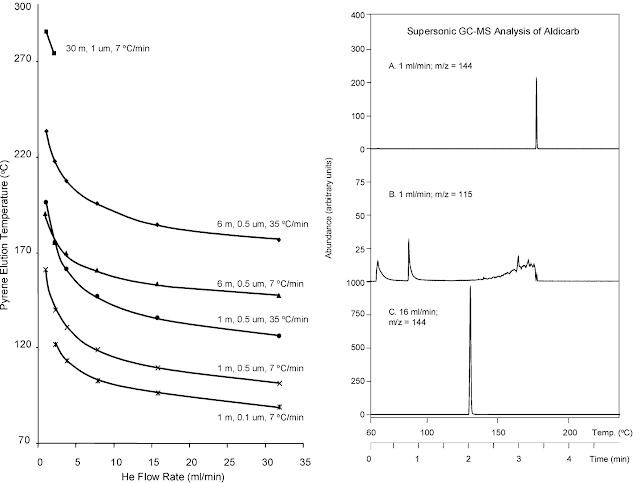 A comparison of standard GC-MS (upper traces) and GC-MS with Cold EI (bottom traces) analysis of a mixture of 10 ppm each hexadecane (n-C16H34), methylstearate, cholesterol and n-C32H66 that were injected with split ratio of 40 (250 pg each compound on-column). In Figure 7 below we demonstrate the analysis of the heavy and polar Nonoxynol-9 (condom spermicide) and as observed this analysis is highly successful with the 5975-SMB GC-MS with cold EI. All the Nonoxynol oligomer mixture compounds eluted, from Nonoxynol-3 up to Nonoxynol-14, while Nonoxynol-9 being the most abundant group of isomer peaks. 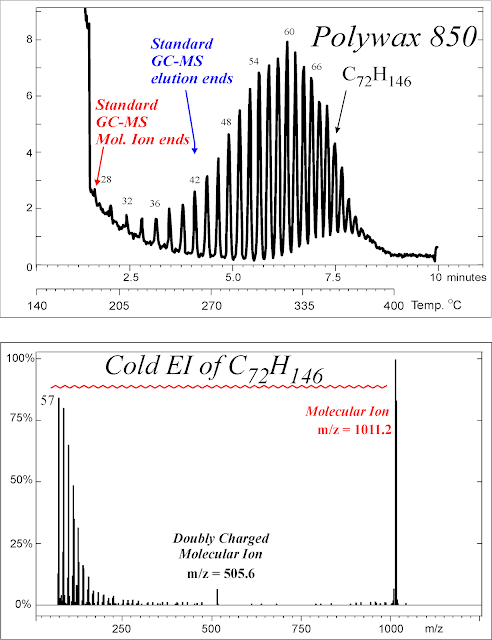 The Cold EI mass spectrum of Nonoxynol-9 exhibits an abundant molecular ion (>70% relative abundance) and is very informative with additional five characteristic high mass fragments. The demonstrated TIC sensitivity is also good and practically without visible baseline noise. In contrast, as shown in the upper Figure 7 insert, the limit of detection with standard EI is about 2 µg Nonoxynol-9 mixture and for that sample no molecular ion is observed in standard EI already for Nonoxynol-5. Thus, as shown, for the same injected amount of 2 µg mixture, the 5975-SMB GC-MS with Cold EI is few orders of magnitude more sensitive, far more informative and even three times faster in the analysis of these heavy and semi-polar Nonoxynol-9 compounds. More details on the analysis of nonoxynol-9 can be found in another post in this blog. For the purpose of this blog article discussion the analysis of nonoxynol-9 provides a nice demonstration of how standard GC-MS approaches its limit of range of compounds amenable for analysis while GC-MS with Cold EI significantly extend it up to and over nonoxynol-14, and how with standard GC-MS the detection sensitivity gradually declines with mass. Figure 7. 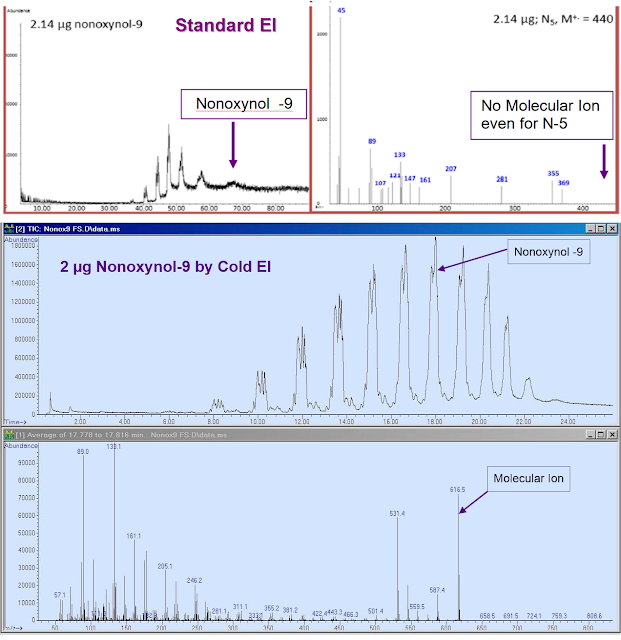 Total ion count mass chromatogram (upper trace) of Nonoxynol-9, and a representative Cold EI mass spectrum of one of the Nonoxynol-9 isomers. Note the abundant molecular ion and rich and informative mass spectrum of this heavy polar compound. The upper portion of Figure 7 shows the analysis of Nonoxynol-9 by standard GC-MS, taken from the supplementary material of the paper by R. A. Musah, A. L. Vuong, C. Henck and J. R. E. Shepard, J. Am. Soc. Mass. Spectrom. 23, 996-999 (2012). As shown, the limit of detection with standard EI is about 2 µg Nonoxynol-9 mixture and for that sample no molecular ion is observed in standard EI already for Nonoxynol-5. Significantly extended range of thermally labile compounds that are amenable for analysis. The significantly lower elution temperatures from the GC column in combination with the use of temperature programmable injector with high injection flow rates enable a major increase in the range of thermally labile compounds that can be analyzed which is complemented and supplemented by the Cold EI enhanced molecular ions that proves the elution of intact thermally labile sample compound. In fact, GC-MS with Cold EI is equivalent and even superior to LC-MS with APCI or APPI in its range of thermally labile compounds that are amenable for analysis. In APCI and/or APPI the sample is thermally vaporized at a very hot liner like vaporization oven (400-500ºC) where the sample stays for a short time, while in GC-MS with Cold EI the sample is vaporized at much lower injector temperatures and spends much longer time at the column at much lower temperatures. Since the effect of thermal degradation exponentially depends on the temperature, Cold EI can be gentler to thermally labile compounds than APCI/APPI. Significantly extended range of low volatility compounds that are amenable for analysis. The significantly lower elution temperatures from the GC column with high short column flow rates enable a major increase in the range of low volatility compounds that can be analyzed. We found that we can approximately double the molecular weight and size limit of compounds that can be analyzed in comparison with standard GC-MS to about 1200 amu for non polar compounds and 800 amu for polar compounds. In fact, GC-MS with Cold EI is equivalent in its range of compounds to LC-MS with APCI or APPI. Significantly improved analysis of compounds that are difficult to analyze by standard GC-MS. Many compounds belong to the group of compounds that can be analyzed by standard GC-MS but their TIC signal to noise ratio is much poorer than of easy to analyze compounds and their molecular ions are weak or absent. Example of such compounds is the group nonoxinols that is shown in Figure 7. GC-MS with Cold EI significantly improves the analysis of these compounds via the elimination of intra ion source partial degradation and peak tailing plus via the provision of abundant molecular ions. Figure 8 serves as our attempt to summarize the extension of the range of compounds amenable for analysis that is achieved by the 5975-SMB GC-MS with Cold EI. In Figure 8 we plot the mass (molecular weight) dependency of the relative intensity of the molecular ion in standard EI (red line), total ion count relative peak height in standard EI (purple line) and both total ion count and molecular ion in Cold EI (blue line). As plotted, the purple line shows the gradual decline of the average total ion count peak height with mass. In part this is due to growing range of larger compounds that degrade in standard GC-MS at the injector, column and/or ion source and in part this decline is due to ion source peak tailing that grows exponentially with mass. As shown, we claim that compounds with molecular weight over 750 mostly do not elute or if they elute their TIC peak height is 1000 times weaker (lower). One example is the nonoxynol-9 that as shown in Figure 7 above, its TIC S/N with standard EI is over 500 times poorer than with Cold EI. In addition, as is well known, the relative abundance of the molecular ion declines with mass due to growing (with mass) contribution of intra ion thermal energy. In another post in this blog we demonstrated that for linear chain hydrocarbons both the relative and absolute molecular ions abundances decline by about 20% with each added carbon atom. Figure 8. A cartoon that demonstrates our perception of the average sensitivity gain of Cold EI with the 5975-SMB GC-MS with Cold EI versus sample mass, which at some point is transformed into extended range of compounds amenable for analysis. Thus, according to our Figure 8 the relative abundance of the molecular ion is reduced by about an order of magnitude already for compounds with molecular weight of 400 amu, which is based on our findings. In Cold EI, the decline of the total ion count peak with mass is much slower than with standard EI and thus we showed its blue line up to molecular weight of 1200 amu although for polar compounds we estimate its limit as 800-900 amu. For example, the molecular weight of Nonoxinol-14 is 836 and an example of a polar compound with molecular weight m/z=852 is shown in our post on Measurement and Optimization of Organic Chemical Reaction Yields. 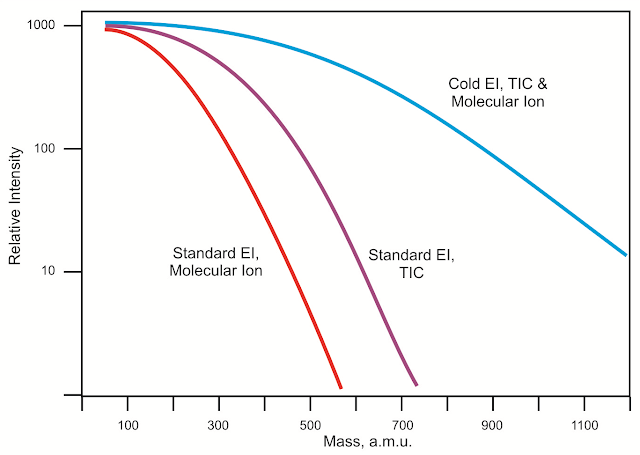 Furthermore, in Cold EI the relative abundance of the molecular ion does not decline with mass hence the one blue line represents both the average TIC and molecular ion dependence on mass.